“How was I supposed to know my son would turn out to be Leonard Bernstein?” was the retort of the great American composer’s father when upbraided for putting pressure on his son to carry on the family beauty goods business! 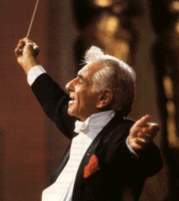 Of course Bernstein was to become one of the most multi-talented American musicians of all time; not only was he a great composer, he was also a fine pianist, conductor and lecturer. This year to celebrate 100 years since the great man’s birth, I have programmed his Clarinet Sonata and “Scenes from West Side Story” in a number of upcoming concerts (see Concerts page for details). Leonard Bernstein always said that the musical language of America was jazz and to hear his take on this do come along to hear me, John and Paul play “Riffs” in one of our Clarinet Goes to Town trad jazz concerts! Speaking of legendary American musicians brings me on to Copland, whose concerto definitely straddles the worlds of classical and jazz and was written for the King of Swing, Benny Goodman. I look forward to playing it as part of the English Symphony Orchestra’s American programme at St John’s Smith Square, London on April 19th.